I am thankful for my success and proud of my role in achieving it. When I think of my success I'm thinking especially of my family. We are a close family with so much love, and my children are really great people. I'm so proud of them. My husband and I have built something together that is really special. It's interesting that so far each of the cards I've pulled for affirmations have been wands. It's so appropriate for someone who is trying to learn to love herself and change her life. It requires a real fire-in-the-belly sort of ambition, which the wands represent. 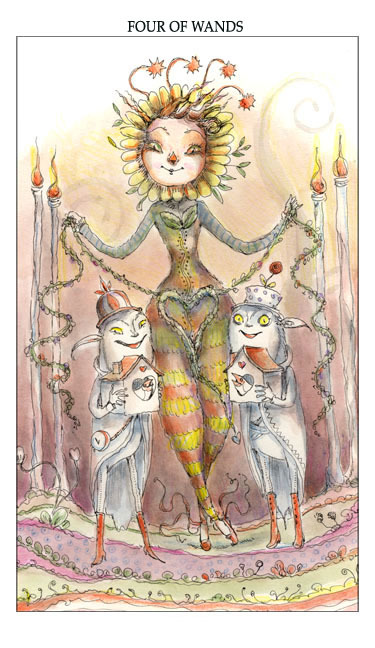 The four of wands is one of my favorite cards! This one is very pretty and cheerful. There's a sense of stability (4) and also an uplifting and active vibe from the wands!